After living in California for over 35 years, Ted Simon, author of Jupiter's Travels, has purchased a house in France and opened a writer's retreat. His new home has ample room to accommodate aspiring writers, film makers and artists, and maybe even a traveler passing through. He's always had a foot in France, having gone there for the first time after the war, on a bicycle and then later living in France, so the move back to France was something he knew would happen sooner or later. Ted is soon to be 86 years old, and while back in California, he had been thinking of what he wanted to do with his time in his dotage, how he could share what he’s learned over the years with others. He thought that he would like to encourage people to write or document their trips so that others can hear what is going on in the world, and to help writers get their books published. So, he came up with a plan to go back to France and to open a writer’s retreat. He put up most of his own money, and with the help of some generous people who donated the balance of what he needed, he purchased the house. The writer's retreat is in the South of France, not far from the Mediterranean Sea. The village of Aspiran, is located in the Hérault Valley, and has been settled as far back as the Gallo-Roman times. About 10 years ago, a Roman winery dating back to 10 AD was found in Aspiran, believed to be the earliest commercial wine operation in France. In the middle ages, Aspiran became the property of the Aniane Abbey, and within an enclosure, the village of Aspiran grew, with four doors allowing entry in to the French commune. You can still see two of the doors that were used in those times. Between the 1400's and 1600's houses were built, and over the centuries the village spread out of the walls, vineyards grew larger and wine growing became the mainstay of Aspiran. And to this day, it is still known as a wine village producing both red and white wines. Aspiran sounds like the perfect backdrop for a writer's retreat, what better inspiration than a medieval village, with a mixture of the old and the new? And why go to a writer’s retreat, let alone Ted Simon’s? In our modern times, we are inundated from the left and right by technology, which can be a good thing, with information at our finger tips. But, it can also be a huge distraction. We are available to anyone around the clock, with easy access to text messaging, emails and social media. And this can make our life hectic, taking away or disrupting us from focusing on writing or creating. It can be tough to make the time, when others may not understand your need to throw yourself in to your work. At a writer’s retreat you can immerse yourself in your creation and explore the possibilities. And the special thing about Ted Simon’s retreat is the support of a writer who wants to and is willing to share his experience and knowledge to help other writers. Although the idea of the writer’s retreat was specifically intended for Jupiter’s Travellers, Ted is open to any one who is writing or has an idea for a book, a film, or artwork. He encourages those interested to get in touch with him through his website, have some conversation back and forth with him, and see if you’re a good fit. To live with Ted for a time in this special place, with the encouragement of an accomplished writer and traveler would be an exceptional opportunity, perhaps the chance of a lifetime. To find out more about Ted Simon’s writer’s retreat go to his website at http://jupitalia.com/. 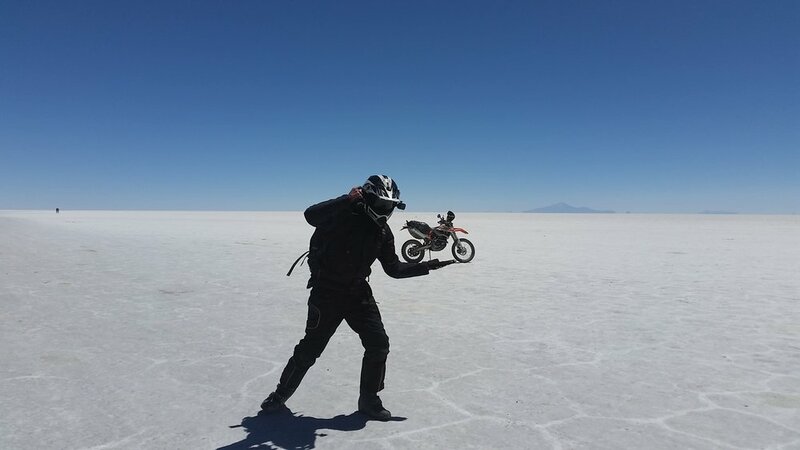 Aaron Steinmann’s bike of choice for a trip through New Zealand and then from Chile to Oregon, and on to Alaska, is the KTM 500 EXC, a bike that many say is a street legal dirt bike, an enduro which is an unusual choice for a long distance trip. But, despite being designed as a high performance and high maintenance bike, it was the best choice for Aaron, and he’s been pleased with the ride. 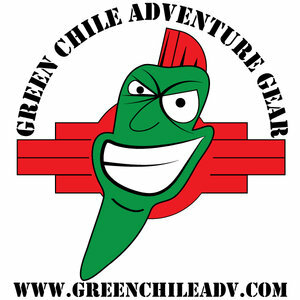 Riding through South America is a popular choice for many adventure motorcyclists and Aaron shares some stories about border crossings, talks about taking the Stahlratte around the Darien Gap, and how he handled the frequent maintenance that the KTM requires. 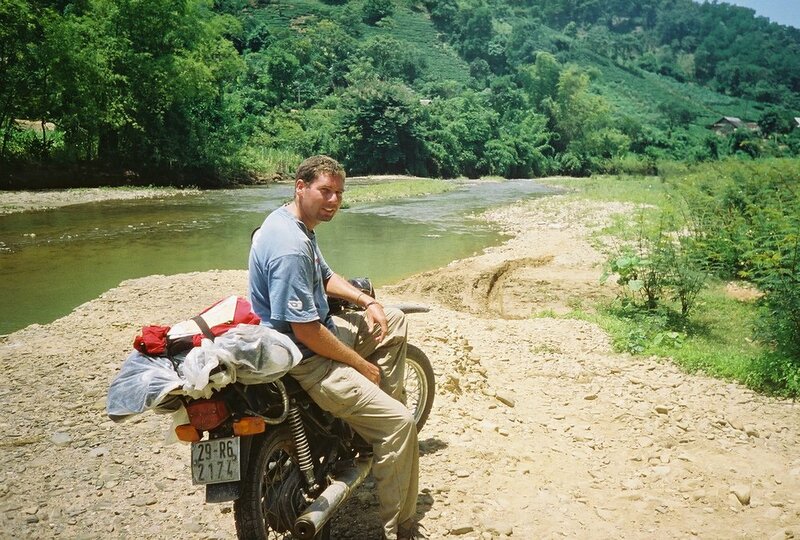 This is another example that the perfect motorcycle for adventure travel, is whatever you like.